Remember my bleeding gradient tutorial? It's the perfect technique for some awesome Halloween colors. The colors I used here were Neon Yellow (Savina), Pucci-licious (Color Club), and Black Onyx (OPI). Reminds me of Frankenstein's monster's head. Love this look. Great color choices too. This is perfect; I have been meaning to try out this technique and each time I see you wearing it, it makes me want to more! 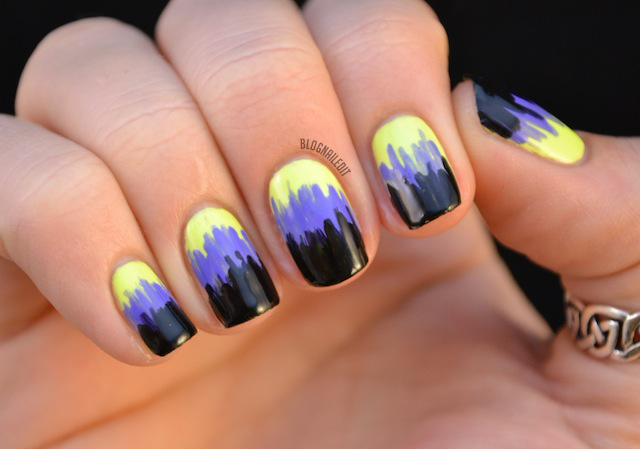 The color combination is beautiful, great mani! very cool! these are my favorite halloween colors! Oh my gosh!!!!! This looks awesome!!! Hehe melty Frankenstein. Loves it! Really cool! Love the colours you've used!